STEPHEN SPAZ SCHNEE: 12 is just about ready to be released. How are you feeling about how the album turned out and the reaction to it so far? CHRIS MURPHY: I’m not sure what the reaction is beyond people commenting on my Instagram account and anyone who finds themselves there is probably going to say something positive. Of course, I want to think that people care but regardless I am just happy to be creating an enormous body of work, which if people don’t acknowledge in the present, still makes me happy. I like to say we are making music for rock journalists in the future. SPAZ: This is yet another collection of exceptional songs. How difficult is it to make the final group decision on what songs by each writer will end up on the album? Or does each member choose their own tracks that they want to go on the album? Sloan are the juxtapositions between each of our styles. SPAZ: With four distinct songwriters in the band, was their ever talk about making it a double album? 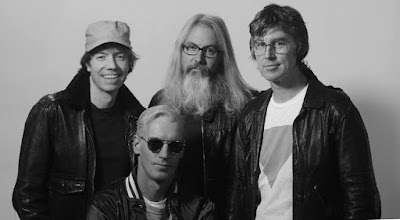 SPAZ: One of Sloan’s greatest achievements is constantly recording music that remains timeless. 12 follows that trend, which means it is thoroughly modern yet reaches across the decades for inspiration. Do you purposely try to avoid current musical trends that would ultimately make your music sound dated? JAY FERGUSON: I’m not sure if we consciously avoid anything modern, but maybe just what we write and record simply reflects our tastes. I think the last time we were truly or arguably “current” was when we made our first record, SMEARED. It was very informed by what was happening in the UK at the time around the whole Creation Records scene…My Bloody Valentine, Ride, Teenage Fanclub…and also underground music in the USA that was starting to head overground…such as Sonic Youth, Nirvana, The Breeders. By the time we made our second album, TWICE REMOVED, I’d say at that point we were a bit conscious of trying to not sound completely current, mostly because it was an effort to try to set ourselves apart from the onslaught of noisy guitar bands that had emerged in the wake of Nirvana‘s success. Pavement, for example, were already moving in that direction with CROOKED RAIN, CROOKED RAIN…a record that was released just as we were finishing TWICE REMOVED. Anyhow, today I think we just do what we like without conscious effort to sound old or current. CHRIS: We usually leave it up to people who work in radio to decide what songs have a shot of getting on the radio. From the beginning, we have split the money and the credit for all the Sloan songs equally between the 4 writers. All songs written by Sloan. It prevents any one of us from becoming rich while the others watch in frustration. As you can imagine, such a situation has killed many a great band. SPAZ: Technology is always evolving. Has Sloan’s recording process changed along with it over the years? JAY: When we started, we would make demo recordings at home on 4-track cassette machine. Our first records were recorded on both 16-track 1″tape and 24-track 2″ and since 2001, we’ve mostly recorded our records using Pro Tools or Logic. I guess the digital technology has allowed us to go back and repair mistakes that we might have let go in the past. You’d think that the process would be faster with technology, but it seems to take as long, if not longer, these days. We often record in pairs or occasionally three’s …but it’s a rarity for us to all be playing together while recording. We last did that for ACTION PACT in 2003, a record where a more live ensemble feel was the purpose of the record. SPAZ: Power Pop. Those are two words that bring pure joy to fans but strike fear in the hearts of musicians. Where does Sloan stand in the world of Power Pop? Is that a term you feel comfortable with or do you shy away from it? CHRIS: Personally, I tend to love everyone who is saddled with the term Power Pop, which I would describe as Beatles fans post-Led Zeppelin who are doomed to commercial failure. I get that it’s a goofy category but most of the best Power Pop bands are my favorite. Another way of describing it is tuneful/crafty music that is without another easy description like Punk or New Wave. Cheap Trick is pretty cool company. Thanks. SPAZ: Do you feel that being a Canadian band – and being isolated from the over-populated American big city music scenes – has allowed you to hang onto your own unique musical vision? JAY: Hmm… I think geography has little to do with it. I’d perhaps think that mainly the good medium amount of success we’ve had allows us or gives us enough reciprocation from fans and concert goers to continue the way we have. SPAZ: Since 1991, you’ve managed to maintain the same band line-up. This is almost unheard of in the music business. What has been your secret in holding the band together for so long? And if one band member decided to retire from Sloan, would the rest of the band choose to carry on? JAY: I guess with the way we’ve identified ourselves over the years as four distinct songwriters it would seem weird if we weren’t all on board…. but I think that’s one of the elements that has kept us together as well – the band is an outlet for everyone. It’s not like there’s the disgruntled rhythm guitar player or whatever who doesn’t get to record his songs. We also share the bounty (when there’s bounty to be had!) and we’re in the same boat when times are leaner so that we’re all on the same playing field. I think that helps curb divisiveness and encourages to work towards a common goal. SPAZ: Have they ever thought about releasing four solo albums at the same time… like KISS? JAY: Every time we get together it’s the number one topic of discussion! No, not really… I mean the Melvins kinda beat us to the punch there back in 1992 or 1993. Chris and I would have joked about it over the years, and I guess the closest we came to that concept was our last LP, Commonwealth. A double LP where we each had our own side of a record to curate and sequence as we each saw fit. I think that doing it that way was better…makes for an interesting LP that we’d not attempted before. SPAZ: What is next for Sloan? JAY: There’ll be lots of touring for this new LP, but I think the next large project will be a reissue of our fourth LP, NAVY BLUES, in a triple LP box set form as we’ve done with TWICE REMOVED and ONE CHORD TO ANOTHER. Chris and I have been digitizing lots of old 4 track cassette demos and some outtakes from the 24 track master recording to include in the box. It’ll be good! JAY: I’ll answer for Andrew (Scott) in that he often has Sirius channel “’40’s on 4” blasting (I use the term “blasting” relatively) whenever we are travelling to a nearby show in a van. I can’t complain! Personally: I’ve been enjoying the only LP by The Flame – the band signed by Carl Wilson to the Beach Boys’ Brother Records label…featuring Blondie Chaplin and Ricky Fataar. The new U.S. Girls album IN A POEM UNLIMITED is pretty super. The debut LP by Partner In Search Of Lost Time from last year is a rocker. Some Peter & Gordon (! )…still enjoying last year’s Phoenix LP TI AMO.